Starbucks already rolling out mobile order for Android, rest of U.S.
After a successful run in the Pacific Northwest and in states such as Alabama, Florida and Texas, Starbucks will extend its mobile order and pay feature nationwide starting Tuesday. That means people in New York, Chicago and San Francisco can order a latte on their smartphones, just as many Portlanders, Angelenos and Seattleites have in the past few months. 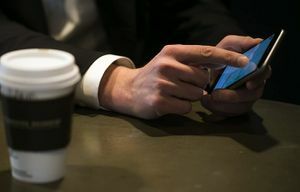 The Seattle-based coffee giant will also enable the feature, previously available only on Apple devices, on its Android app, expanding its universe to the other half of smartphone users. The moveswere announced at a New York investors conference in early September. At the time the announcement surprised analysts, because until then the company had hinted toward a holiday-season rollout for the technology. According to Starbucks executives, the feature was so popular, allowing coffee drinkers to skip long lines as they order and pay for their drinks on their smartphones, that they accelerated the expansion. “The rollout has gone better than we expected” among both customers and staffers, says Adam Brotman, the executive in charge of Starbucks’ digital efforts. Brotman won’t say exactly how much mobile order and pay has boosted sales. But David Palmer, a longtime Starbucks analyst who works for RBC Capital Markets, says it’s as much as a 2 percent bump, which for a company with $19 billion in expected sales this year means hundreds of millions of dollars. In a September note raising its earnings outlook for Starbucks, Palmer wrote that mobile order was key in driving the share of mobile payments to 21.6 percent of total sales in August 2015, up from 12.2 percent the previous year. It’s also a critical factor in Palmer’s rosy price target of $64 per share for Starbucks stock, which even in this year of volatile markets has defied gravity. Shares Monday closed at $57.74, 41 percent higher than at the beginning of the year. RBC estimates that mobile ordering accounted for 15 percent of all sales in the Pacific Northwest region at the end of June, just six months after its debut in Portland and three months after being deployed in the Pacific Northwest. Moreover, RBC concluded that the average mobile-order check was 15 percent higher than the typical ticket. RBC doesn’t spell out the details of its consumer panel-based research, but it says in the past it has proved accurate in predicting same-store sales growth in the United States. That’s not to say adoption hasn’t been free of controversy. Some baristas have expressed concern in online forums about whether bypassing the counter dilutes Starbucks’ oft-stated vow to create a human connection between its staff and customers. Brotman, in an interview, acknowledged that at first, some baristas were “a little afraid, or a little tentative,” but that overall they’ve embraced mobile order and pay. “It just shifts the connection between the partner and the customer to the area where the customer picks up the food and beverage,” and surveys have shown more satisfaction among customers and staffers, he said. Brotman said efficiency and shorter lines can help sell more coffee, and it opens up opportunities for customers that didn’t exist before. For example, busy, harried parents of young children can get in and out of the store more easily, and “speech and hearing-impaired customers are calling it a game-changer,” Brotman said. Starbucks also said that mobile order and pay will be launched in the United Kingdom and Canada in October.